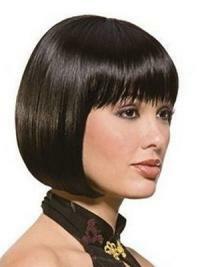 The Wig is a classic Bob style wig. This bob wig never dates, is always in fashion and is of exceptional good quality for the price - a must-have addition to your collection of wigs. I try on several wigs in a shop, and have trouble finding a natural look. This wig is GORGEOUS. just received today, and it is on my head, and really takes yrs off my look. i will never have enough of my hair to even style again, so this is like having that just from the hairdresser' look all the time.. i will definitely buy WigSiS again. Just received my wig, surprised it arrived so soon as I live overseas. I'm very happy with it. I was a little sceptical about buying a wig online as I have never purchased one before. But it's the exact same one in the picture. Thankyou, I will definately be a regular buyer! I purchased 3 of these; they look so natural on me and many compliments. Never wore a wig, as I've decided to out grow layers in my hair to achieve this look eventually. It's great in between hair growth, comfortable fit. A must if you want a trendy, natural style with eye catching appeal! I have worn many wigs and pieces over the years. I found this modern looking wig and hoped it would arrive on time and look real! Well it did arrive and looked GREAT! I am now a new fan of your site! THANKS! I bought a shiny, yellow, "Barbie Doll" colour, so I toned it down to look more natural. I wish they would make it in a more natural looking. It's a very swingy, cute style with soft, silky hair that doesn't tangle easily. I have curled this wig with hot rollers & I brush it wet & it doesn't hurt the fiber at all. It's a great wig at a low price & it makes me feel young!